Amidst news of what women can and cannot do, and diktats on their right to religious freedom with regard to traditions and culture, a Muslim couple got their nikah solemnised by a woman Qazi earlier this month. This marks another victory in women reclaiming spaces that have just been taken up by men, irrespective of what religion has to say about it. Maya and Shamaun, a couple based in Mumbai, got their nikah solemnised by Qazi Hakima Khatoon in Kolkata on January 5. A communications consultant by profession, Maya tells me that when a few years ago she read an article stating that a woman can also be a Qazi and solemnise a nikah, something that she was not aware of like most others because it is not common practice, she and Shamaun decided that their Qazi will be a woman. Although in Islam there is nothing that stops a woman from solemnising a nikah, the practice is so uncommon that even locating a woman Qazi can be an impossible task. There have been earlier instances where a couple has asked a woman to carry out the nikah, but these instances are so rare and a woman Qazi so difficult to find that most nikahs, if not all, are conducted by men in Muslim families in India. Maya and her fiancé came across the Bharatiya Muslim Mahila Andolan’s (BMMA) website and saw that the movement had trained women Qazis in Quranic and constitutional rights. They got in touch with BMMA in 2017. When asked why they chose a woman to conduct the ceremony, the couple said ‘why not’. 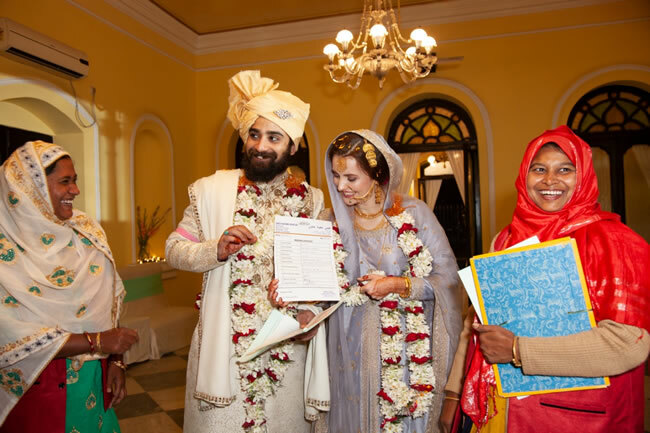 Maya and Shamaun’s nikah marks a new beginning for women’s rights – an ordinary Muslim woman activist, who has, after undertaking a rigorous course on rights of women in the Quran and the Constitution, been invited by a regular couple to solemnise their wedding. A practice which has been mostly limited to the male domain for centuries. “It feels nice to give another woman a platform like this, which ideally should be easily available to her anyway. It has been empowering for her and me, both,” Maya tells me. Qazi Hakima says she cannot explain in words what it has meant for her to be approached and to be able to successfully solemnise the nikah for the couple. She is also aware that as part of her duties as a Qazi she is responsible, under the training that she has taken, to ensure that there is proof of residence and age, and an affidavit from the groom stating that he is not previously married (the marriage is not polygamous). 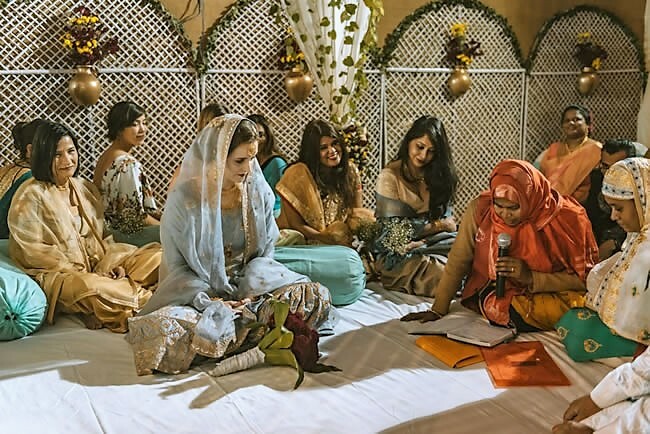 She has to make the couple go through the Nikahnama, fix the mehr (dower) amount and ensure that it is given at the time of the nikah, has to counsel the couple and ensure that the marriage is being carried out with their full consent. BMMA has trained 16 women Qazis in Maharashtra, MP, Rajasthan, Tamil Nadu, Karnataka and Odisha. Maya, who is half-Bengali and half-British, has a degree from the School of Oriental and African Studies, London. Owing to her belonging to a liberal household, both her family as well as her in-laws were very happy with the decision of the couple. Until the wedding happened and people started reaching out to them, they did not see their decision to choose a woman to solemnise their wedding as ‘a big deal’. Muslim women have long been denied rights which the Quran has guaranteed to them, because of the patriarchal norms set by society at large to keep them confined and subjugated. This is changing today when the ordinary Muslim woman is questioning the status quo and is not ready to accept customs and traditions being forced on her in the name of religion. Whether it is re-entering Haji Ali and demanding that religious spaces be easily available to all women, or fighting to ban instant triple talaq, Muslim women are the frontline warriors fighting their own battles. Qazi Hakima and her like need to be supported so that more couples come forward to get their nikahs solemnised by them – where the mehr will not be a mere eyewash and never be asked to be forgiven, the couple will be made aware of their rights and responsibilities, underage marriages will not be solemnised, and the bride will get all her due rights as per the Quran. Mariya Salim is a woman’s rights activist and researcher, and a member of the Bharatiya Muslim Mahila Andolan. Views expressed are the author’s own.